If the electronic components of your treadmill are not working properly or you have recently performed maintenance on it, you might need to reset it. Resetting a treadmill is a relatively quick process. Just push your treadmill’s reset button and then a few buttons on the console. Depending on the type of treadmill you have, there are three possible ways to reset it. Unplug your treadmill from its power outlet and insert the safety key into the appropriate slot. Find the reset hole on the underside of the console. Plug the treadmill back in to a power outlet, insert a cotton swab or a small piece of plastic into the reset hole and push the "Reset" button. If “CL11” appears on your console, proceed to Treadmills with Current Software. If nothing appears on your console, proceed to Treadmills with Older Software and LCD Display if your treadmill has an LCD display or Treadmills with Older Software and LED Display if it has an LED display. Refer to your user’s manual if you are unsure which type of display you have. Press the "Reset" button again; “CL 21” will appear on the console. Press the "Enter" button on your console five times until “CL 26” appears on the display. Press "Enter" one more time so that “E” appears. Press "Enter" and, after “SS” appears, press the "Start/Stop" button. Press "Enter" and allow the treadmill to run until it stops on its own. Unplug the treadmill for at least 30 seconds. Remove the safety key and plug the treadmill back in. Push the "Reset" button once so that “10” appears on the display. Press the "Enter" button five times, then "Start" once, then "Enter" once more. Replace the safety key and press "Enter." Press the "Power" button three times. Press the "Enter" button four times, then "Start" once, then "Enter" once more. Press the "Power" button and wait about eight minutes while the treadmill resets itself; the treadmill will run on its own during this time. 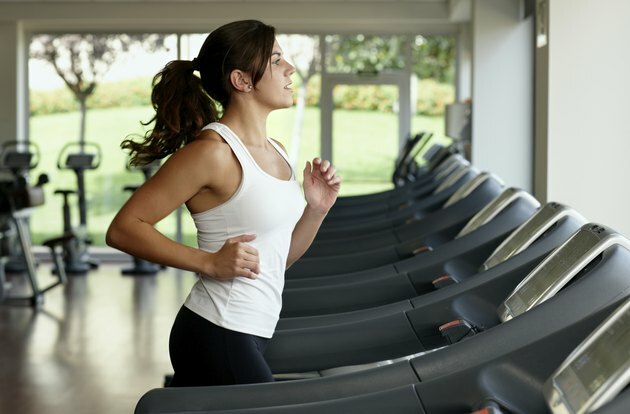 Regular maintenance keeps your treadmill running well for many years. Never stand on your treadmill's belt while resetting the treadmill. Resetting causes the belt to start and stop automatically, which can lead to injury.